The only new routes to be climbed in the following 20 years are Luke Newnham’s eliminate Under the Volcano, and Dave Brash’s route on the steep wall and prow left of Top Cat. Unwilling to place the first bolt at Mihiwaka, he stuck his neck out on the unfashionably serious Pasta la Pizza. Call me old-fashioned, but it would be nice if this crag remained a bolt-free monument to the 1970s ‘clean climbing’ movement. 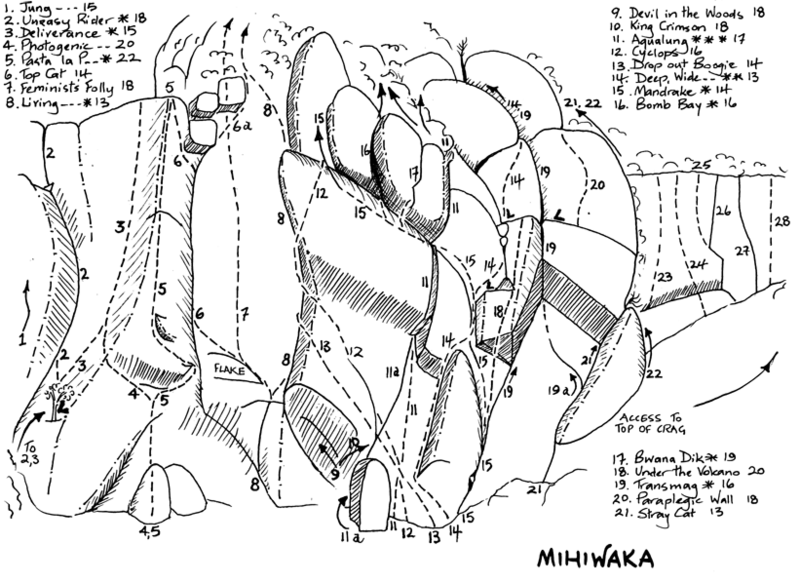 After many years with few visitors, Mihiwaka is justifiably experiencing a minor renaissance. Its easier climbs generally offer better quality and protection for aspiring trad leaders than Long Beach. A rack of medium to large gear with heaps of slings (save some for the manuka tree belays at the top) will see you up most of the climbs. In keeping with the 1970s ambience, this is hex country. Another archaic custom – girdle traverses – are a must at this crag. Pro is good unless mentioned otherwise in the route descriptions. The top is easy to access from the right side of the crag. The climate is damper, more frigid and exposed than Long Beach, and the east facing crag loses the sun in the afternoon, but it is reasonably protected from south/southwest winds. Northeasterly? Forget it! The high point of the road to Long Beach sidles around Mihiwaka 17 km from Dunedin. 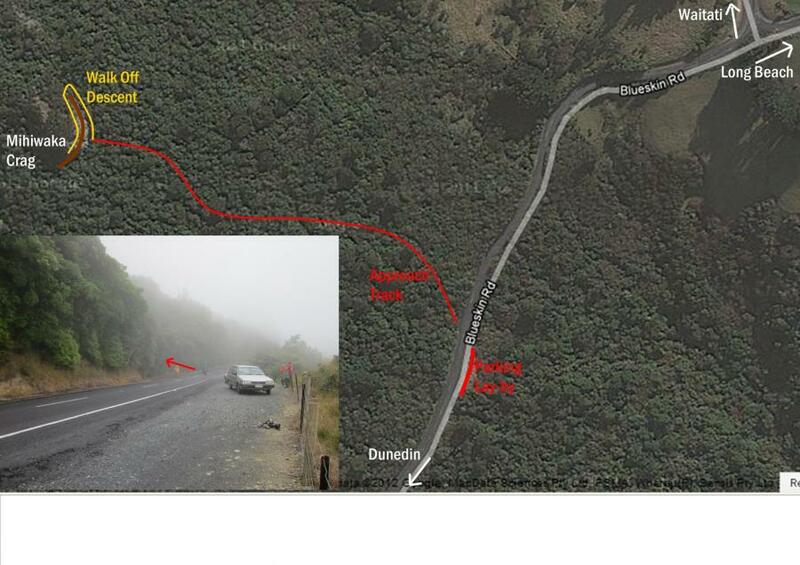 About 300m before the Blueskin Rd turnoff to Waitati, park at the obvious carpark and follow the track uphill from the No. 21 orange culvert marker through beautiful native bush. When in doubt, trend right – many have bush-bashed directly up to the left-hand edge of the crag after missing a bend in the track. The track comes out at Deep, Wide and Frequent. Easy access to the top of the crag is gained to the right. Arete on the far L of the cliff. Finish on L angled crack. Great bridging up to the welcome mega-jug. Start at the prominent R facing corner - best belay is at the broadleaf tree 4m above ground level. Pro is a bit sparse at the crux - take small wires. From the broadleaf tree, move up the wall diagonally R and finish just left of the arete. Good pro higher up in the interesting creases. Has a direct start at about 17 just left of the real steep country of Photogenic Doubt and Pasta la Pizza. From the pedestal between Deliverance and Top Cat, and just to the R of a deep R facing diagonal corner crack, climb the slightly overhanging wall to the horizontal break under the roof (good pro here), then traverse L to rib (runout) and finish up Deliverance. Steep, technical and serious – the cowardly first ascentionist didn’t lead this until he had it fully wired on top-rope. Great climbing – top-rope it if you don’t want to stick your neck out. Climb Photogenic Doubt to horizontal break, then traverse R. Resisting the overwhelming desire to escape into Top Cat, head L into the ear above the overhang - don’t fall off now! Excellent pro for the rest of the route direct up the steep prow. Start up Living in the Past, then move L into R facing corner. Finish at the top of Deliverance (original finish), or move R under the block to join the top of LITP (6a) at about grade 15. The eliminate up the wall between Top Cat and Living in the Past finishes direct up the prominent nose. The second route on the crag. The full-on climbing through the bulge onto the big ledge relents to a nice bridging corner. Step L when the corner fades out and scramble a further 8m to belay from manukas. The corner is a drainage line which can take some time to dry out after rain. From the block, up short mossy leaning crack to nervously hand traverse L on overhanging ground to Living in the Past. Calum’s comment – ‘Is this contrived or what? Can’t actually have any climbing of its own ! !’ Start as for the Devil in the Woods, then move R across to Aqualung. Arguably the climb of the crag - consistently good climbing to the adrenaline-inducing (though well-protected) crux. The original start goes Comici-style direct to the base of the hanging corner above the Mandrake ramp. A nice alternative is diagonally up R (11a) from the top of the big detached block. After arranging your runners and your head, launch out into the exposed hanging corner above the roof – it’s not all over once you get into it. Could be quite good – I can’t remember. This route starts similar to Aqualung, trends L and up wall through diagonal slot under L end of roofs beneath Mandrake (crux) to join Living in the Past, then step R up steep head wall onto ledge of Mandrake to share its finish. Across face from Deep Wide and Frequent to Living in the Past. A grade 13 that overhangs for 20 metres? An excellent adventure for the grade. Originally started further L, the best start is up the wide crack past the chockstone (as for Mandrake). For the two stars (and better pro), climb diagonally R up the upper wall to finish as for Transmag. Watch out for rope drag on this wandering excursion. Hudson – ‘A superlative route !!! My favourite anyway’. Best split into 2 pitches. The left diagonal ramp slashes the main wall at mid height and provides access to the great roof climbs of Aqualung, Bwana Dik, and Bomb Bay. The fearsome flaring slot is in a brilliant position. From the Mandrake ramp, climb with trepidation through the top roof with wide crack and jugs. The groove through the roof between Bomb Bay and Aqualung starts from Mandrake ramp. Protect in Bomb Bay, then go for it, a little boldness is required. Eliminate through bulges between Deep Wide and Frequent and Transmag. You could do this route in one pitch, but then you’d miss out on the great belay ledge. Pitch1 (16) - Start from Deep Wide and Frequent (better) or Stray Cat (19a). Sustained climbing up to and through roof (crux) to a commodious belay ledge. Pitch 2 (13) - Steep start to the easy L leaning ramp. Well, the pro doesn’t look too bad to me, but let’s call it marginal. Climb the wall above Transmag ledge. Follow crack out R of Transmag roof to a few steep wall moves (crux), and a botanical finish. From here, the routes are mostly damp and heavily mossed up, and are recorded mainly as a historical service. ‘An excellent, technical, overhanging wall route – worth a star’ - Hudson. A 70’s crag would be incomplete without girdle traverses, so here they are. The high traverse is - Traverses the wall beneath Mandrake between the roofs, down climbs the headwall of Cyclops, traverses the nose of Feminists Folly, crosses the top of Deliverance, hand traverses L and up the finishing corner of Uneasy Rider!! And the low girdle – Climb Mandrake to the ledge above the chockstone at 5m; traverse L, crossing Top Cat at the big flake to join Deliverance at the lower exposed section before crossing slab and groove to Jung and the Restless.